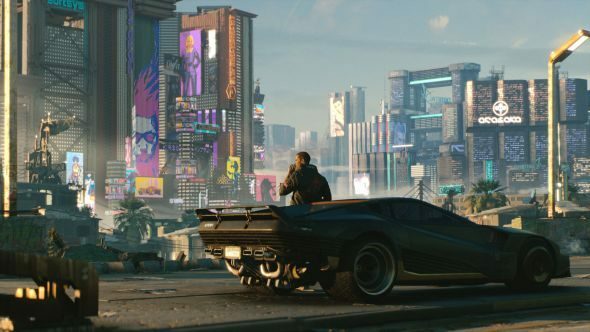 At first glance it may appear that CD Projekt Red didn’t have much to say about Cyberpunk 2077 in its E3 trailer. Some stunning in-engine footage gave us a rich sense of how Night City will look and feel, but we didn’t actually learn all that much about release date, monetisation, and all those crunchy details. Except we did. The glitchy hacker text at the start of the trailer contained a message direct from the developer to all of us, in which they discussed DLC, expansions, microtransactions, release date, and world size. Here’s the lowdown. To continue stoking your excitement for the coming months, check out our list of exciting upcoming PC games. The letter begins with an apology for taking so long to show anything new of Cyberpunk 2077 which, as CDPR acknowledge, was first announced “over 2077 days” ago. They go on to say “you’ll be able to create your own character.” According to the recently updated website, the protagonist is simply named ‘V’, which leaves plenty of room for further customisation. The new trailer has a male voiceover, but perhaps we’ll be able to select V’s gender, and customise their appearance or character class? In the meantime, catch up on everything we know about possibly the biggest game of the near future including theCyberpunk 2077 release date, setting, and more.